KASRA is a gatekeeper to what is under the surface in drum & bass. He does what he does with passion and care, and is a staple in Drum and Bass culture. He began as a DJ and worked his way into the world of production when he started his Critical Music label. Conceived back in 2002 in a front room in north London, the label has grown from a simple idea driven by a commitment to putting out the best music the scene has to offer; it has now become one of the most well respected underground dance music labels in the UK. Nurturing new talent and releasing some of the freshest breaks and beats from the likes of Break, Rockwell, Breakage, Cyantific, Marcus Intalex, S.P.Y, Calibre, Total Science and many more. It has gone on to build a loyal following around the world, driven on by Kasra’s never ending quest to release quality underground bass music. 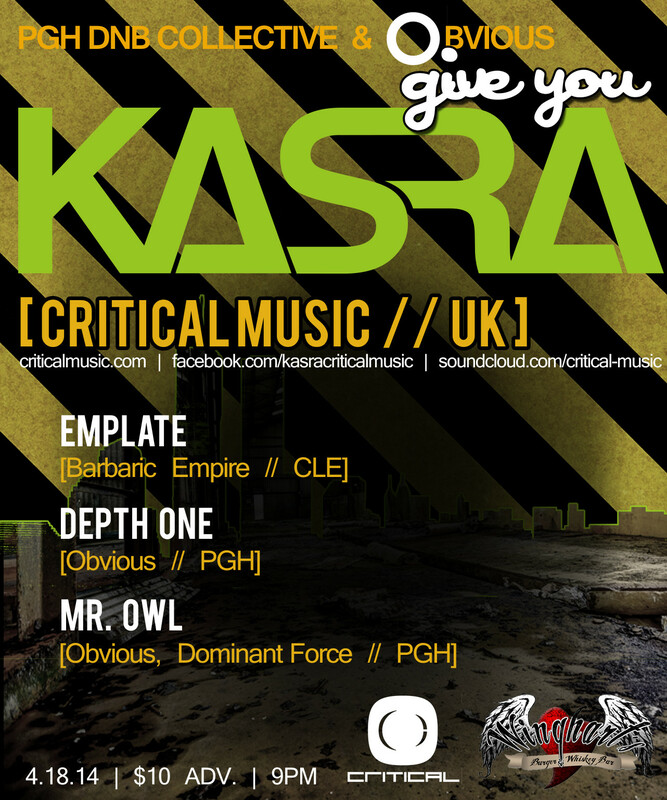 Most notably, Kasra was featured on Critical Music’s Sequence One EP, which included collabs with S.P.Y. and Jubei. Critical Music is now a resident at the legendary Fabric nightclub in the UK, with Kasra given the highest honor of recording Fabric Live 62, one of his most prominent releases. Since his first forays into drum & bass in the late 1990’s as a burgeoning young DJ, there’s no doubt that Kasra has now made an indelible mark on the scene, a mark that continues to grow ever-stronger as his Critical Music empire prospers. This entry was posted on April 8, 2014 by dominantforce. It was filed under Shows and was tagged with Winghart's; Kasra; Critical Music; Obvious; DNB; Pittsburgh; Drum n Bass;.